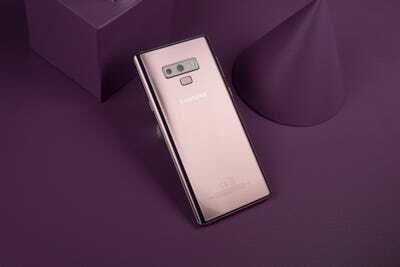 The latest $US1,000 smartphone has arrived in the form of the Galaxy Note 9. 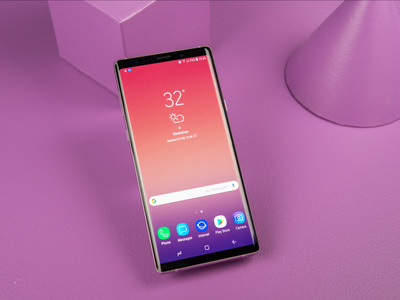 Unveiled at Samsung’s Unpacked event on Thursday in Brooklyn, New York, the Galaxy Note 9 is Samsung’s biggest, heftiest device yet: It has a 6.4-inch screen, a gigantic 4,000 mAh battery, and up to 1 terabyte of storage. Samsung wants you to live your life on the Galaxy Note 9 – to take all your photos on the phone’s advanced camera, to write important notes and sign important documents using the phone’s S Pen, and to hook it up to a screen and turn it into a desktop computer using to Samsung’s DeX technology. In short, this phone is a beast – or at least Samsung wants it to be. Over the past 24 hours or so, I’ve been playing around with the new Galaxy Note 9. I’m not a Samsung user – and my own iPhone 6s feels puny and incompetent next to this thing – so I’m looking at the Galaxy Note 9 with fresh eyes. It’s important to note that I haven’t run the Galaxy Note 9 through all its paces, and I can’t give a full review of the phone after just 24 hours of usage. After we have a few more days to try the device, we’ll post a comprehensive breakdown. The design feels stale, but there are a few things I love about the look and feel of the Galaxy Note 9. At first glance, it’s almost impossible to tell the difference between the Galaxy Note 9 and its predecessor, the Galaxy Note 8. The design is a near-duplicate of last year’s phone, which is disappointing for anyone looking for an iPhone X-like innovation from Samsung. For starters, Samsung moved the fingerprint scanner, so it’s underneath the camera instead of next to it. One of the flaws of the Galaxy Note 8 (in my opinion) was that the fingerprint scanner lived next door to the dual lenses on the back of the phone. For a left-handed user, this was no big deal; it was right next to where your index finger would naturally lie. But for a right-handed user, this was obnoxious, since anytime you went to scan your finger, you’d most likely smudge your camera lenses. Samsung also improved the outer colour of the phone: This year’s blue finish is much better-looking than last year’s model. There isn’t a major difference between the Galaxy Note 8’s “deep sea blue” and the Galaxy Note 9’s “ocean blue,” but I prefer the 2018 version; the colour is simply prettier and looks more high-end. Other than that, Samsung didn’t change a whole lot when it came to the design. One thing that didn’t change that I actually really appreciate is the headphone jack – you’ll find one on the Galaxy Note 9 and for that, I’m grateful. The Galaxy Note 9’s display didn’t change much, but I’m blown away nonetheless. Anyone who currently uses a recent Samsung smartphone probably won’t be impressed by the AMOLED display. It’s the same resolution as last year’s Galaxy Note 8, and only a hair bigger – 6.4 inches compared to 6.3 inches. That being said, there’s no denying it’s gorgeous. Of course, any OLED display would look incredible compared to my iPhone 6s, but the Galaxy Note 9 is particularly impressive because of the size. This comes into play when you switch to full-screen mode when taking a photo, or when you’re scrolling through Instagram during downtime. Watching videos feels like a whole new experience – I like to watch makeup tutorials on YouTube, and I could see way more detail and much more vibrant colours than I’ve ever seen on my own device. Samsung may not be doing anything wildly innovative with the Galaxy Note 9 display, but just because it’s not new and exciting doesn’t mean it’s any less impressive. The S Pen is innovative and incredibly useful. I’ve never owned a phone with a stylus before, so trying the S Pen for 24 hours opened up a whole new world. Taking notes, drawing, and tapping around the device using the S Pen is surprisingly fun, and gave me this automatic feeling, real or not, of increased productivity. BLE lets you use the S Pen in a variety of ways. It works as a photo remote, so you can take selfies or group photos without having to be near your phone (the S Pen works with your phone from up to 30 feet away). It can also become a remote for a presentation, although I haven’t needed to try that feature yet. Beyond that new functionality, the S Pen just looks great. 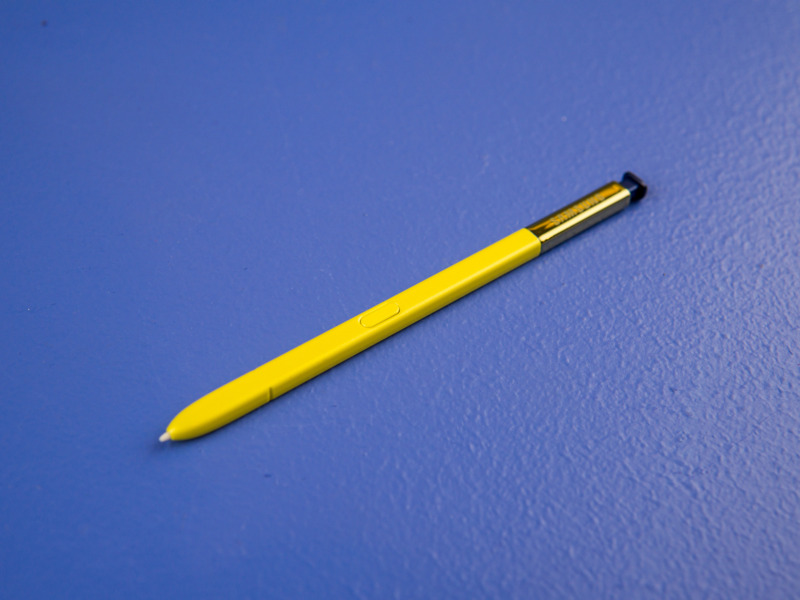 The Galaxy Note 9 I’m using is blue, an the S Pen that comes with it is bright yellow. The only strange thing about that is that all the other colours of the phone – lavender, black, and copper – have S Pens that match the device. I found myself wishing Samsung had made the contrasting S Pen standard across the board. Adding more artificial intelligence to the Galaxy Note 9’s camera was a smart move. My favourite smartphone camera on the market is on the Google Pixel 2, and for a simple reason: It relies on technology rather than hardware to take great photos. With the Galaxy Note 9, Samsung is starting to head in that direction as well. While Samsung phones have long had excellent cameras, I don’t think they’re the best you can buy. 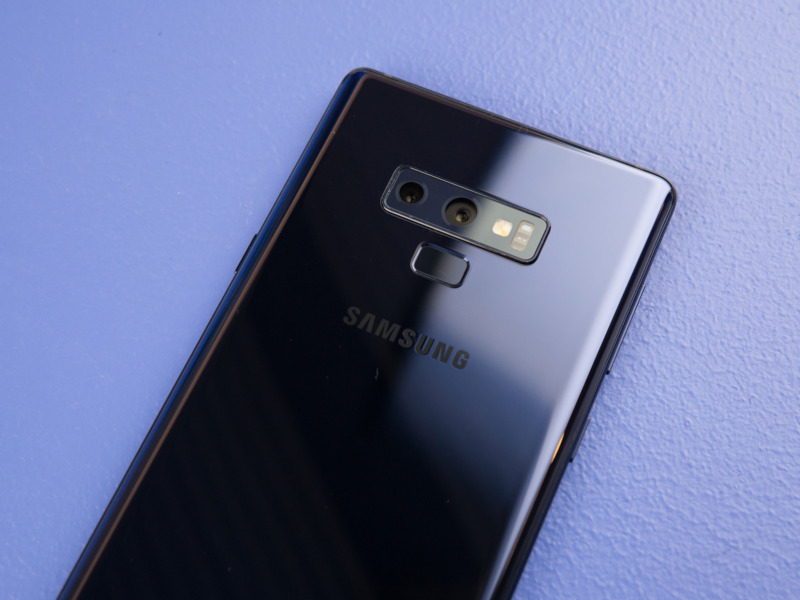 With the last few Samsung phones I’ve tried – the Galaxy S9, Galaxy Note 8, and Galaxy S8 – the photos tend to look overly sharpened and too bright, and the automatic face smoothing on selfies is often so extreme, it looks cartoonish. But the Galaxy Note 9 is different. 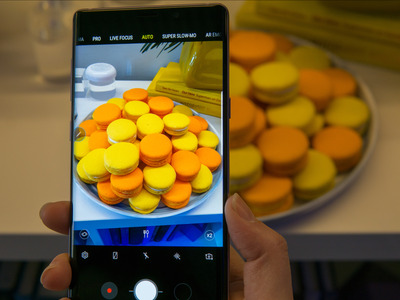 It still has some of the same tendencies – unnaturally bright and sharp photos – but it now has an added layer of technology that gives the phone an edge in the smartphone camera wars. A new camera feature called scene optimizer will recognise what kind of object you’re photographing and automatically adjust the settings so you can take the best shot. The camera also has flaw detection, which will alert you if the image is blurry, or if the subject blinked. With these features, Samsung is taking an already-great camera, and adding a layer of artificial intelligence on top. 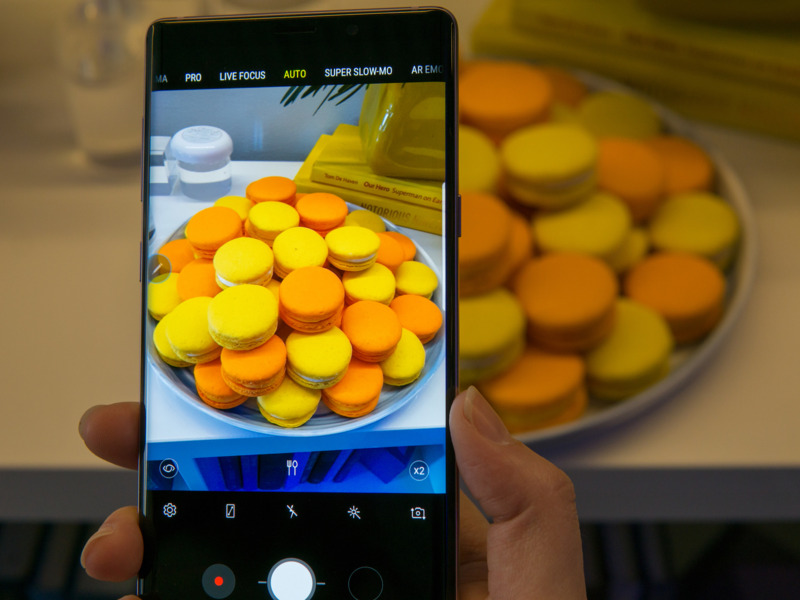 This alone isn’t enough to choose the Galaxy Note 9 for its camera – and we’ll have to test it more to know if it’s effective or just a gimmick – but it’s an encouraging sign of where Samsung is heading. Overall, I’m impressed by the Galaxy Note 9 so far, but the features that Samsung says make it worth the $US1,000 price tag can’t be tested in just one day. There are a few key features that Samsung says set the Galaxy Note 9 apart from its predecessors and from other high-end smartphones: battery life, storage, speed, and versatility. Those are features that are hard to test in just one day. What I can tell after just one day is that this phone has a unique place in the smartphone world. It’s a phone for people who are hyper-connected and have jobs that require a super-powerful smartphone. But it’s also a phone for people who don’t want to shell out for a phone and a laptop, and want a device that can do it all. As someone who falls in the middle of that spectrum, I don’t think it’s the right phone for anyone who’s like me. Beyond those reasons, it’s also difficult to get excited about a device that, on a surface level, is so similar to the phone that came before it. It’s a beautiful, luxurious device, but it also doesn’t feel particularly new. 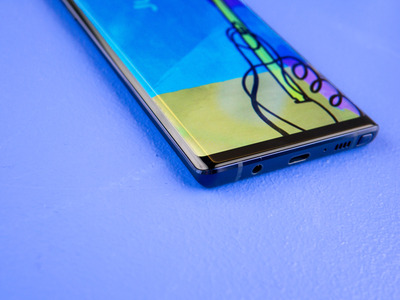 So until we know whether what’s under the hood outweighs what’s on the surface, to me, the Galaxy Note 9 remains something of a question mark.